42 are Manual, 11 are Hydraulic and 21 are a combination of Manual and Hydraulic. The Narrow Locks take 70′ craft with a maximum width of 6’10”. The chaperoned transit of Standedge Tunnel must be booked in advance and takes place on Monday, Wednesday and Friday each week of the cruising season. 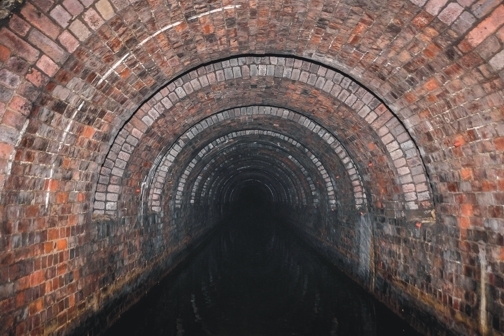 Click here to view the Customer Guidelines for Standedge Tunnel. 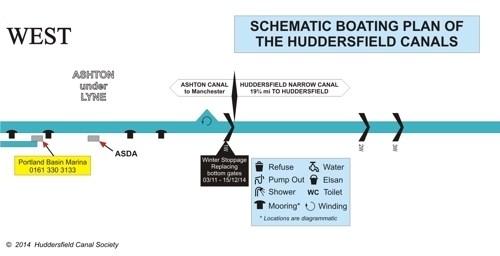 Download a pdf of this handy plan of the Huddersfield Canals – Click on the graphic to view a pdf of the plan with the option of downloading. Using a pdf reader, such as Adobe, you can zoom and scroll the plan to get the information you need for your journey along our marvellous canals! Boaters – Have your say! Download our interactive questionnaire, give us your views on navigating the Narrow and help us guide our ideas about future investment. You can click on the graphic opposite to download and then save the blank questionnaire. You should then use a pdf reader, such as Adobe, to load and complete the form on screen, before sending it back to us. Have a Trip on the Marsden Shuttle! 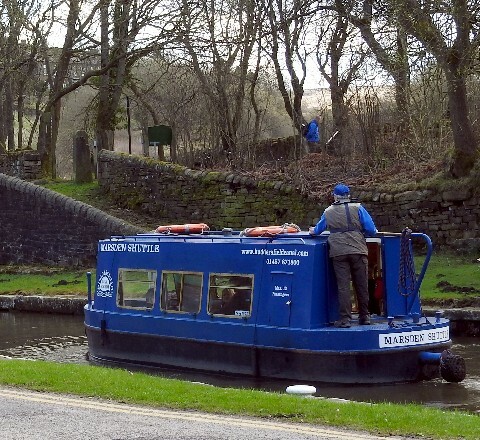 Society volunteers run the 12 seater ‘Marsden Shuttle’ Water Taxi between Marsden Station and the Standedge Tunnel Visitors’ Centre. It operates weekends, bank holidays and some weekdays during school holidays, depending on the availability of its skippers and crew. Check our online trip calendar to see when it is running. Boards are displayed at either end when operating. The first trip leaves from above Lock 42E, very near the Station, at 11.20 am finishes about 4.00 pm. The trip to Tunnel End takes about 12-15 minutes. See this map of where the trip starts. These boat trips are free of charge but donations are always welcome to help us with fuel costs and keeping the Shuttle in good working order. Thank you. Hire the Marsden Shuttle for your Wedding or special event! For weddings and receptions at the Standedge Tunnel Visitors’ Centre our Shuttle provides ideal transport for the bride and groom and guests between Marsden and Tunnel End. All proceeds go to our Society. 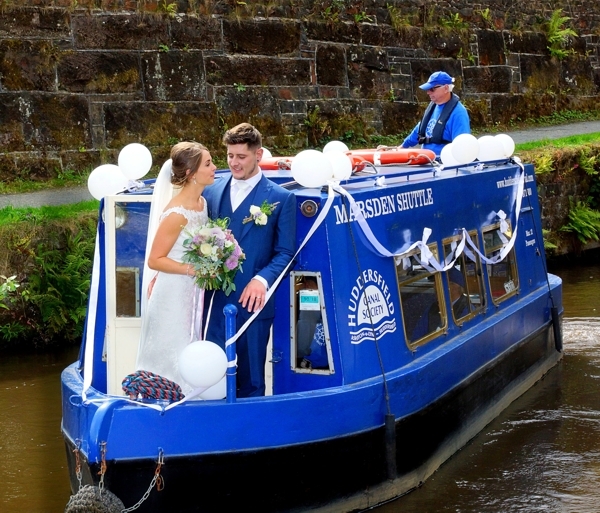 To book our boat for weddings at Standedge contact the Canal & River Trust at weddings@canalrivertrust.org.uk or on 01484 844298 and mention you would like to use the Marsden Shuttle. If you would like further information, to hire the Shuttle for other events or to volunteer to help crew our boat, please call us on 01457 871800. Guided short trips into the Standedge Tunnel at Tunnel End. Seasonal through trips of Standedge Tunnel. Details are on their website. 51-seater ‘Still Waters’ at Portland Basin. Wheelchair lift available for disabled passengers. 12-seater ‘Community Spirit 2’ at Portland Basin, Ashton-u-Lyne. 50-seater ‘Pennine Moonraker’ at Uppermill. 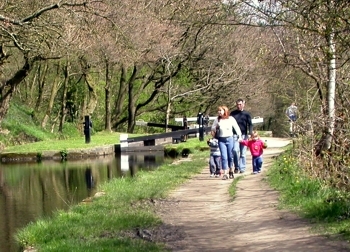 The towpath is an excellent route for everything from a gentle stroll to a more strenuous effort. The surface varies in quality and though generally good, certain sections do become puddled and rather muddy when wet. Our ‘Towpath Guide’ tells you all you need to know. A number of different Fishing Clubs rent and stock stretches of the Canal. 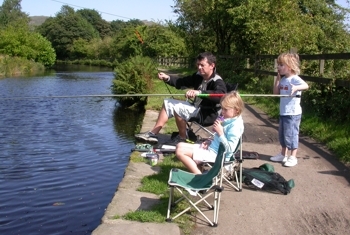 Please see the Canal & River Trust website for full details including applying online for a rod licence click here. 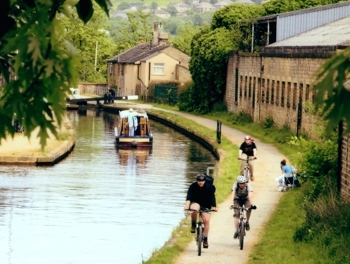 Cycling along the Huddersfield Narrow Canal towpath is now allowed. However, you should be aware that sections are rather narrow and there are a lot of low bridges and ‘blind’ spots. Please consider others enjoying the tranquillity of the canal, especially walkers and fishermen. 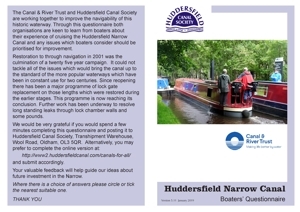 See the Canal & River Trust website for more details, click here. Pedestrians do have priority on towpaths.